Makiwa Mutomba showed an excellent ability to draw at an early age. It was not until his third year at university in 1999 where he was studying Electronics Engineering that he quit studies and started painting pictures for a living. Moving from Bulawayo to Harare, the commercial capital of the country, and then on to the resort town of Victoria Falls. Here he sold miniature paintings at the roadside to tourists, hanging paintings from tree branches. It was at this time that Makiwa developed a love for the knife as a painting tool. 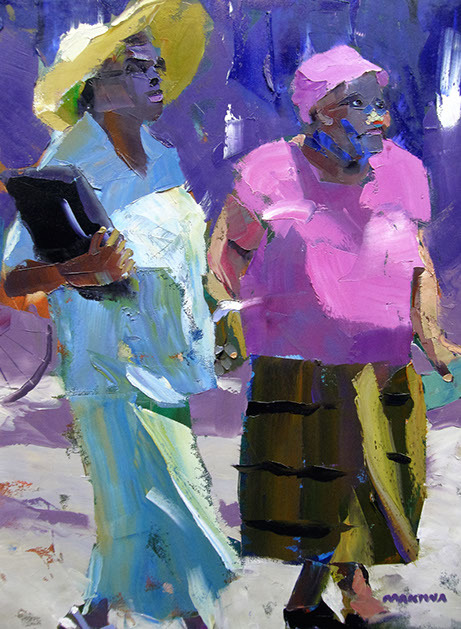 Makiwa is presently living in Pretoria, where he lives with his wife and two daughters, and paints from his studio home.